Group Gordon’s Laura Thurber examines why communication about the L train’s future has gotten off track. Any New Yorker, no matter how long they have lived in the city, has a subway horror story or two. Mine include delays so long it took me an hour to go 3 blocks and bent glasses from a fall by a fellow rider overconfident in his balance. 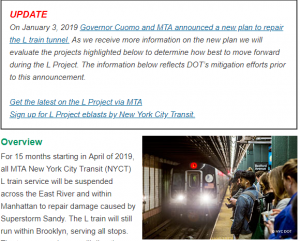 But no subway horror story could have compared to the long-anticipated “L-pocolypse.” The 15-month shutdown to completely repair the Brooklyn-Manhattan tunnel would have left about 250,000 riders without a subway line and with few new options for their commutes. But on January 3rd, the residents of Williamsburg and Bushwick seemed to have been spared: Governor Cuomo announced that the shutdown was canceled. Instead, closures would only occur on weekends and planned work would focus on repairs rather than complete reconstruction. This should have come as a welcome reprieve. But what the Governor’s office may have assumed would be a celebrated announcement has been met instead with only cautious relief, raised eyebrows, and frustration. How did this seemingly positive announcement become a stumble by the MTA, the City, and the Governor? The answer has a little to do with skepticism about the new plan but more to do with the public relations strategy around the rollout. The key to effective communications doesn’t always mean finding the most popular idea. Good PR strategy is more often about timing and the presentation of a clear message. Even if the subject—like the L shutdown—is unpopular, if your audiences can follow the logic of your plan and trust that it’s ultimately the right call, you are on the right track. Unfortunately, the communication strategy around the L shutdown has created more questions than it answered. Is this new plan safe, and will it work? Why wasn’t this the plan from the start, and why did the Governor swoop in at the last minute? It felt rushed and half-baked, leaving many Brooklynites’ heads spinning. Moreover, the lack of clarity about the L shutdown has resurfaced old questions about delays, safety, and the future of the MTA. This was ultimately a missed-opportunity for Cuomo and the MTA. With a clear plan and unified message from the State, the City, and the MTA, this about-face could have positioned Cuomo as the great savior of Williamsburg. Instead, the suddenness of the announcement and mixed signals from those in charge has thrown the Governor’s authority on the issue into question. In the end, a potential PR win has become one in the long line of missteps all too familiar to subway riders. 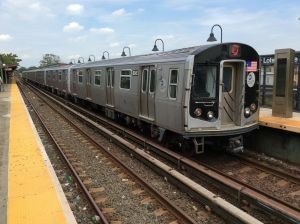 Frustrations with the New York City Subway are something of a pastime, but the L and its riders deserve a better PR strategy.